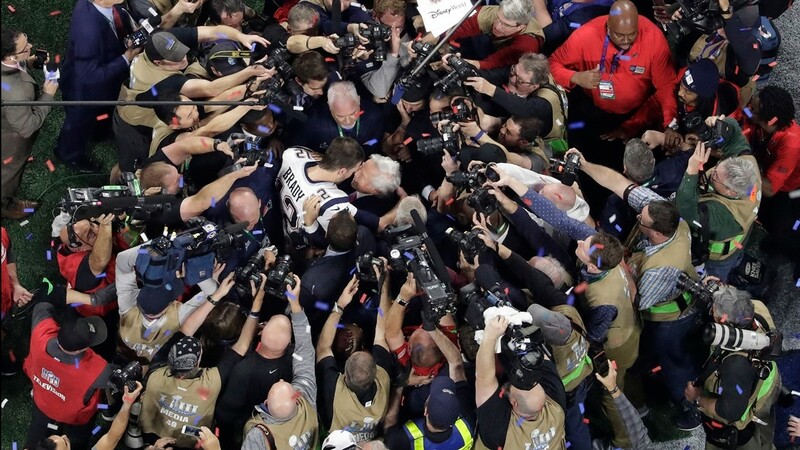 Tom Brady #12 of the New England Patriots embraces with Robert Kraft owner of the New England Patriots after the Patriots defeat the Rams 13-3 during Super Bowl LIII at Mercedes-Benz Stadium on February 3, 2019 in Atlanta, Georgia. 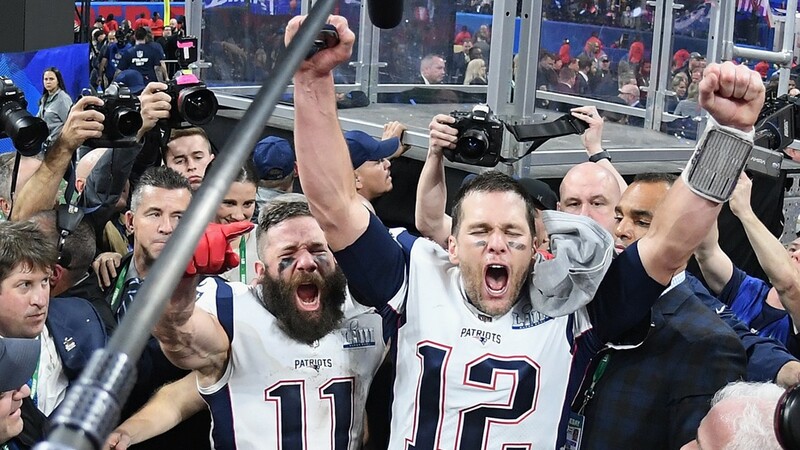 Julian Edelman #11 of the New England Patriots and teammate Tom Brady #12 celebrate at the end of the Super Bowl LIII at Mercedes-Benz Stadium on February 3, 2019 in Atlanta, Georgia. 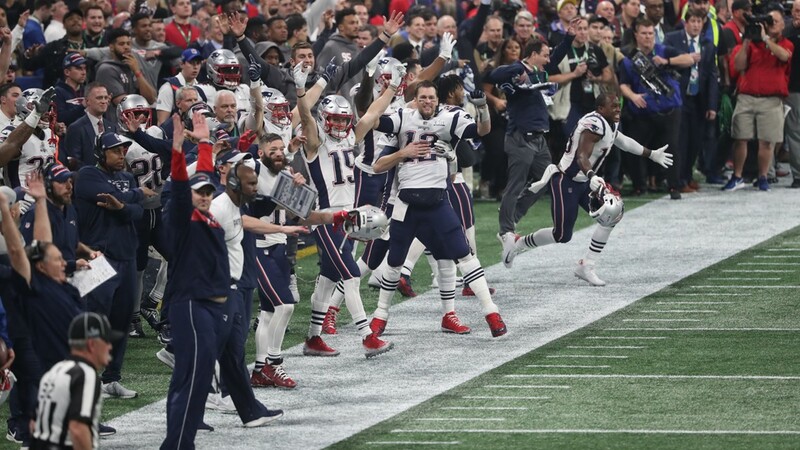 The New England Patriots celebrate after defeating the Los Angeles Rams in Super Bowl LIII at Mercedes-Benz Stadium on February 03, 2019 in Atlanta, Georgia. 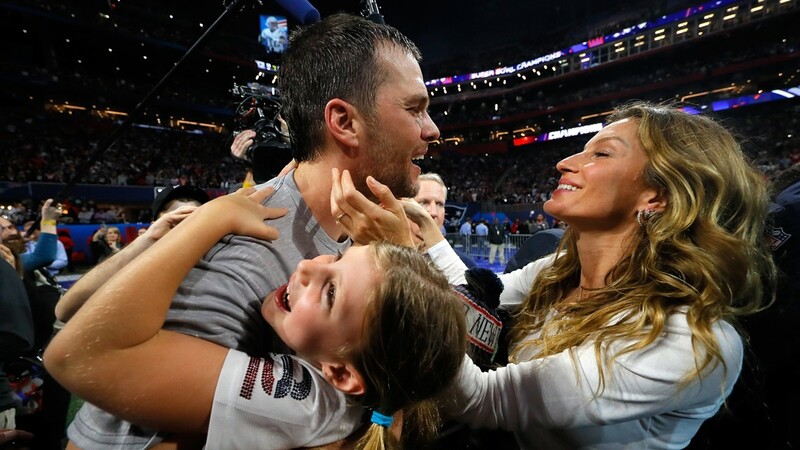 Tom Brady #12 of the New England Patriots celebrates with his wife Gisele Bündchen after the Super Bowl LIII against the Los Angeles Rams at Mercedes-Benz Stadium on February 3, 2019 in Atlanta, Georgia. 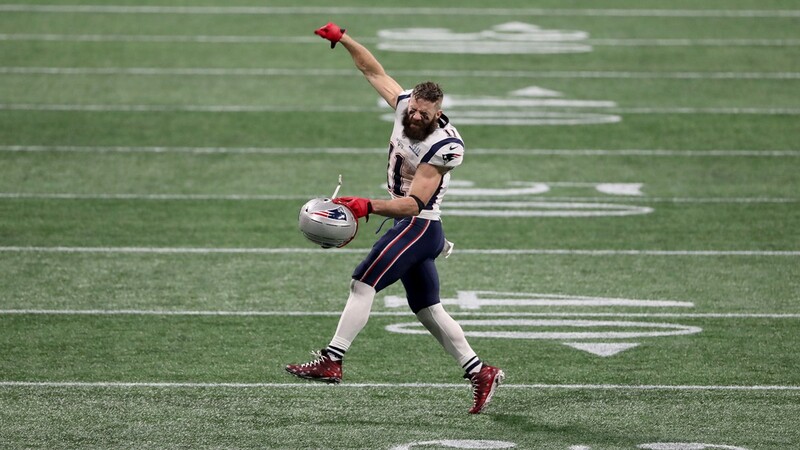 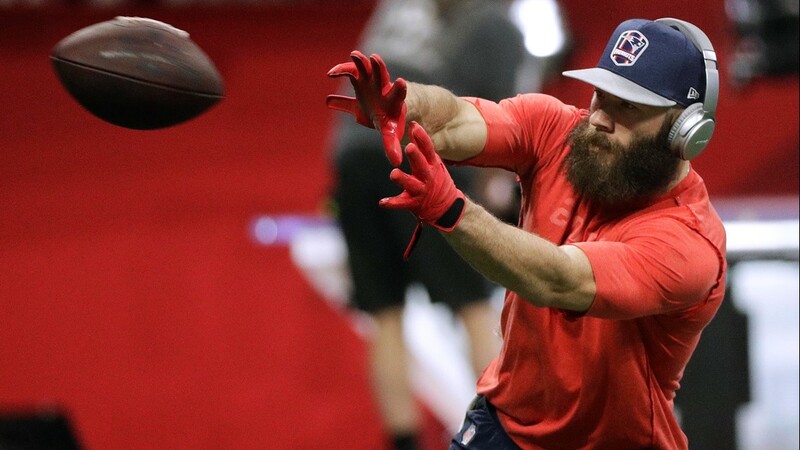 Julian Edelman #11 of the New England Patriots celebrates after defeating the Los Angeles Rams in Super Bowl LIII at Mercedes-Benz Stadium on February 03, 2019 in Atlanta, Georgia. 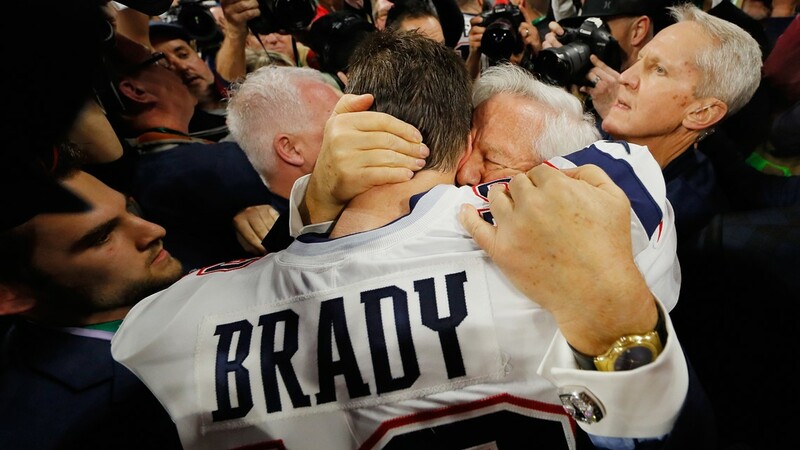 New England Patriots' Tom Brady (12) embraces Patriots owner Robert Kraft after the NFL Super Bowl 53 football game against the Los Angeles Rams, Sunday, Feb. 3, 2019, in Atlanta. 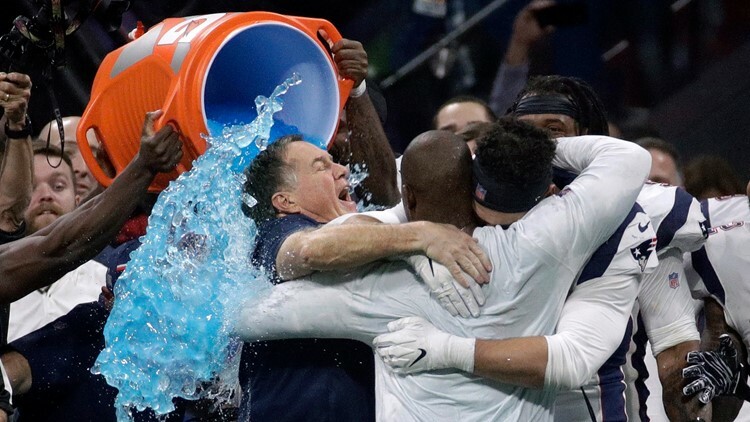 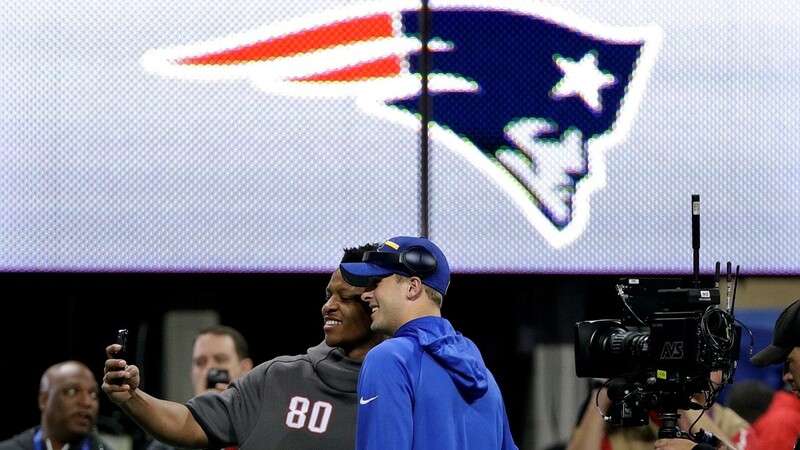 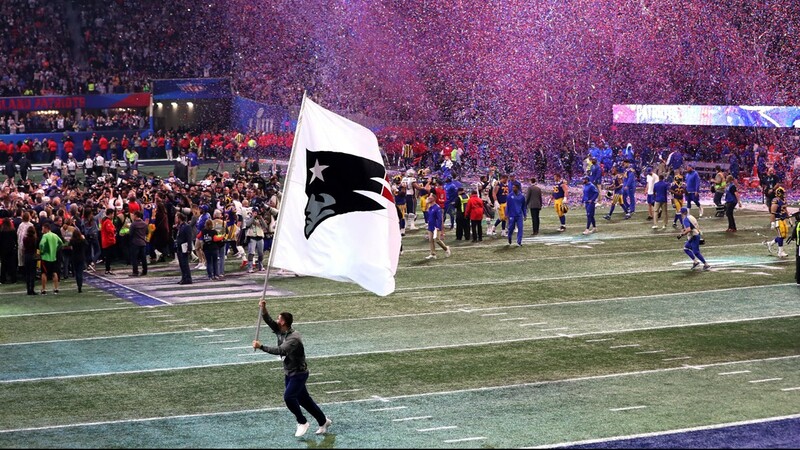 The New England Patriots celebrate their 13-3 win in Super Bowl LIII against the Los Angeles Rams at Mercedes-Benz Stadium on February 03, 2019 in Atlanta, Georgia. 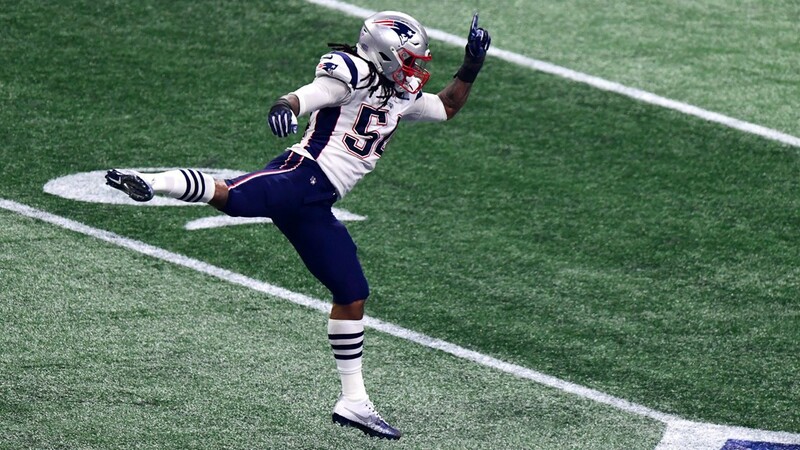 Dont'a Hightower #54 of the New England Patriots celebrates a sack against the Los Angeles Rams in the second half during Super Bowl LIII at Mercedes-Benz Stadium on February 03, 2019 in Atlanta, Georgia. 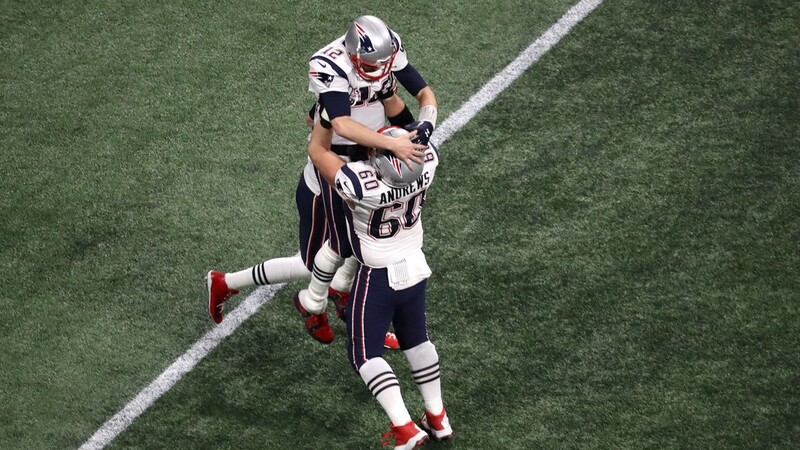 Tom Brady #12 of the New England Patriots is congratulated by his teammates David Andrews #60 and Brian Hoyer #2 after their fourth quarter touchdown against the Los Angeles Rams during Super Bowl LIII at Mercedes-Benz Stadium on February 03, 2019 in Atlanta, Georgia. 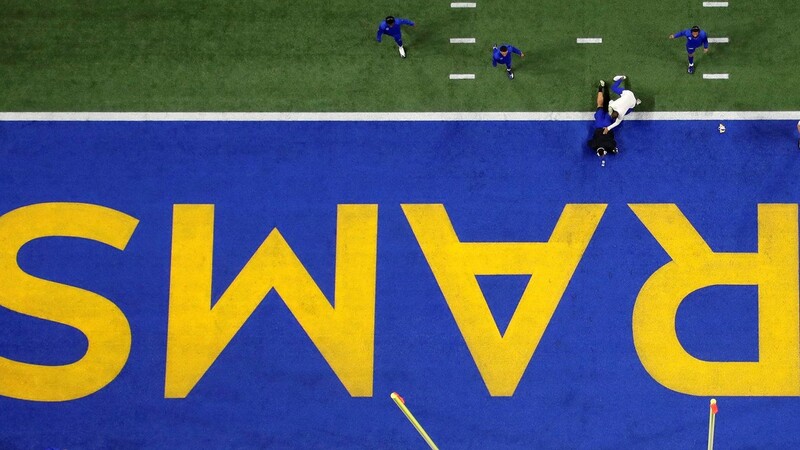 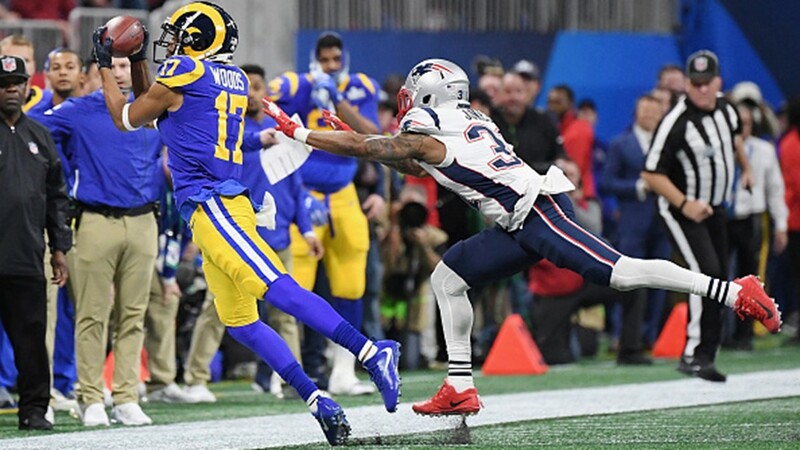 Robert Woods #17 of the Los Angeles Rams attempts a catch near the sideline against the New England Patriots in the first half during Super Bowl LIII at Mercedes-Benz Stadium on February 3, 2019 in Atlanta, Georgia. 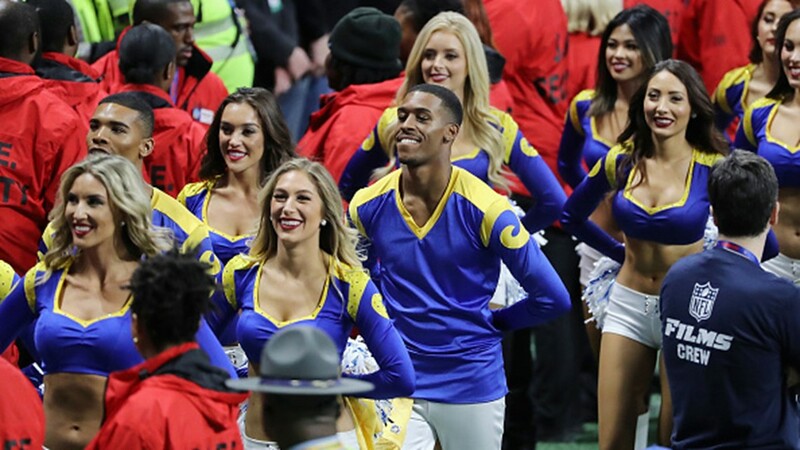 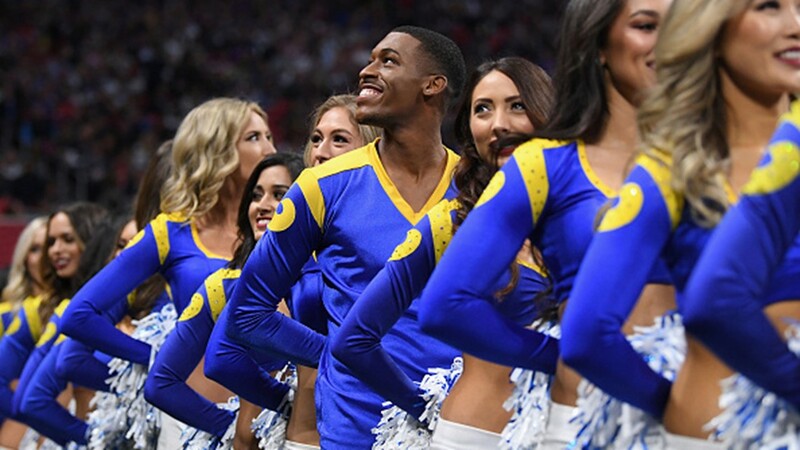 Los Angeles Rams cheerleaders Napoleon Jinnies (L) and Quinton Peron (R) look on during Super Bowl LIII against the New England Patriots at Mercedes-Benz Stadium on February 3, 2019 in Atlanta, Georgia. 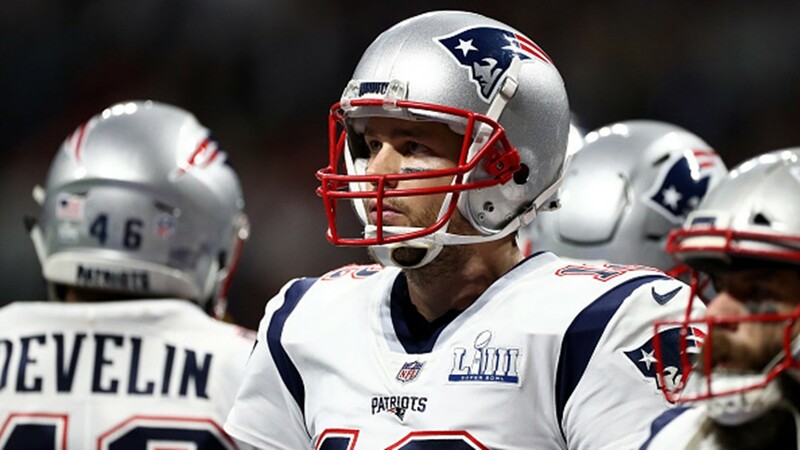 Tom Brady #12 of the New England Patriots reacts against the Los Angeles Rams in the second quarter during Super Bowl LIII at Mercedes-Benz Stadium on February 03, 2019 in Atlanta, Georgia. 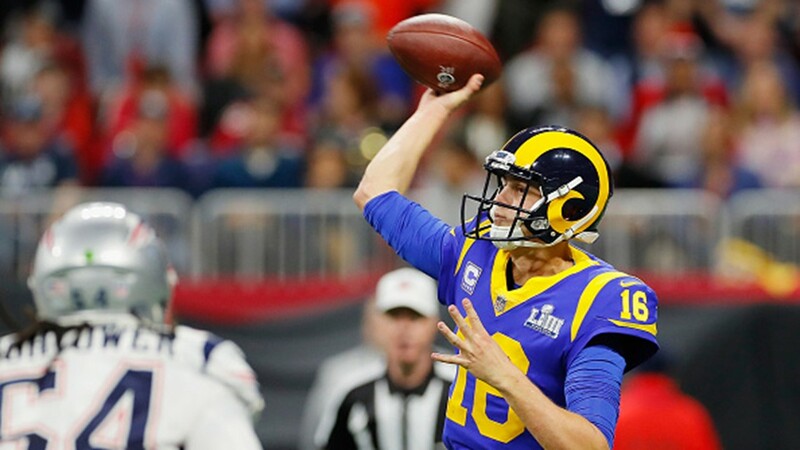 Jared Goff #16 of the Los Angeles Rams throws a pass against the New England Patriots during Super Bowl LIII at Mercedes-Benz Stadium on February 3, 2019 in Atlanta, Georgia. 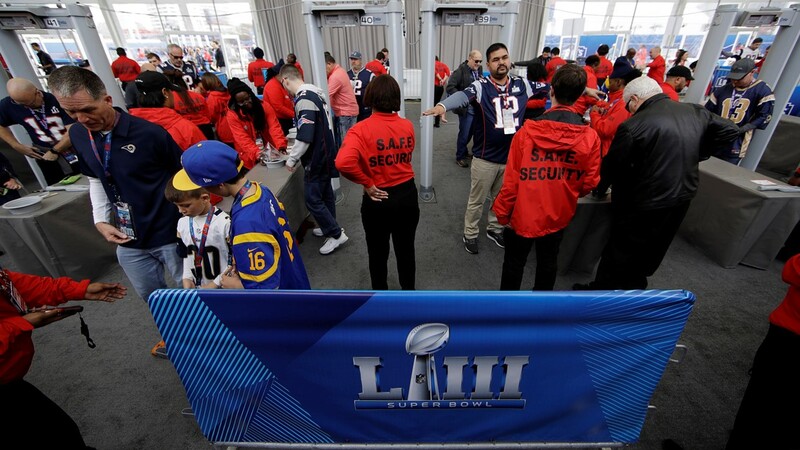 Tom Brady #12 of the New England Patriots looks to pass against the Los Angeles Rams in the second quarter during Super Bowl LIII at Mercedes-Benz Stadium on February 03, 2019 in Atlanta, Georgia. 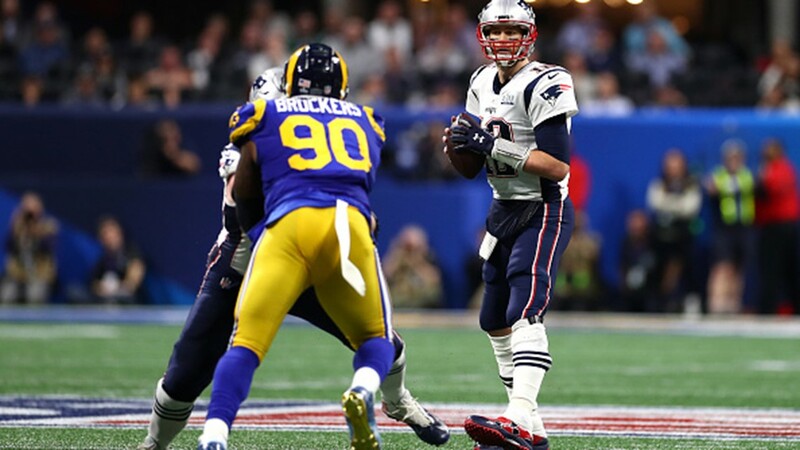 Michael Brockers #90 of the Los Angeles Rams attempts to catch the ball in the second quarter against the New England Patriots during Super Bowl LIII at Mercedes-Benz Stadium on February 03, 2019 in Atlanta, Georgia. 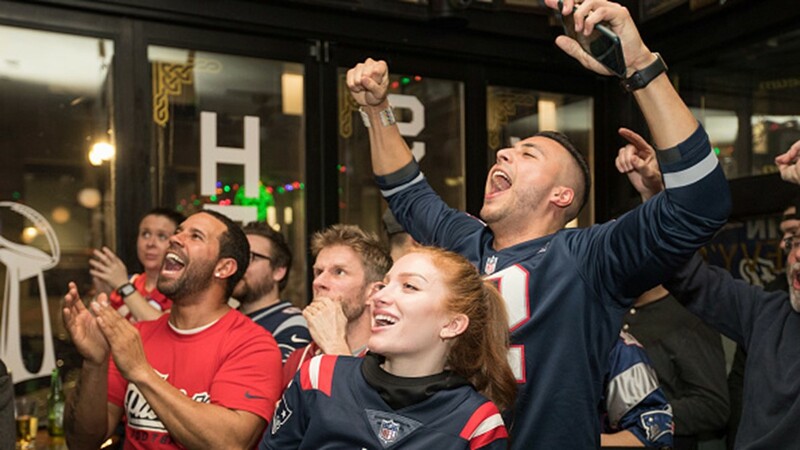 New England Patriots fans cheer during the second quarter of Super Bowl LIII at McGreevy's Bar on February 3, 2019 in Boston, Massachusetts. 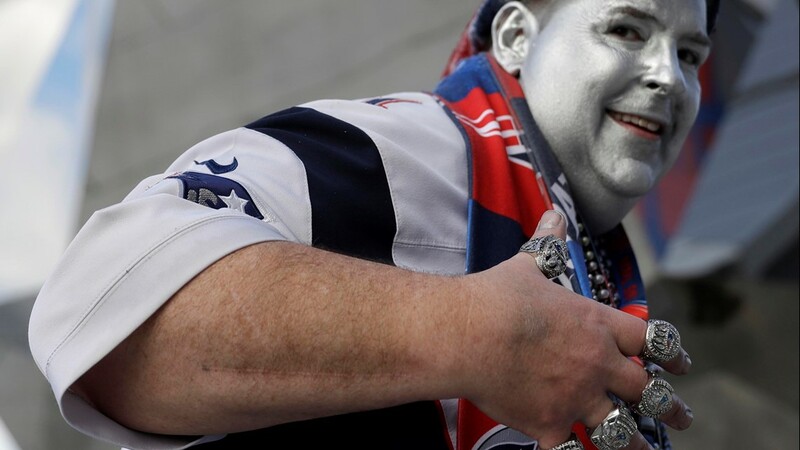 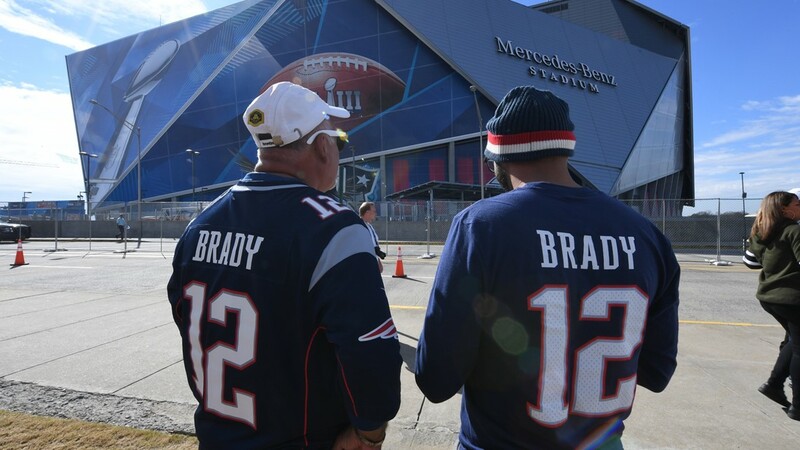 The New England Patriots are playing the Los Angeles Rams in Atlanta. 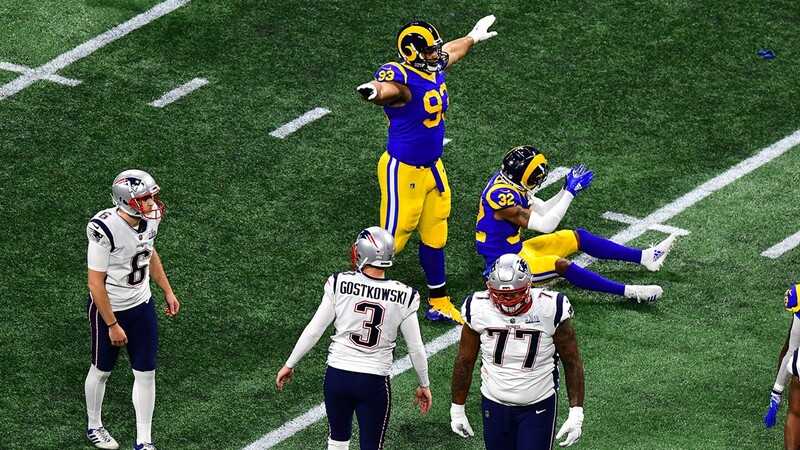 Ndamukong Suh #93 and Troy Hill #32 of the Los Angeles Rams react after a missed field goal by Stephen Gostkowski #3 of the New England Patriots in the first quarter during Super Bowl LIII at Mercedes-Benz Stadium on February 03, 2019 in Atlanta, Georgia. 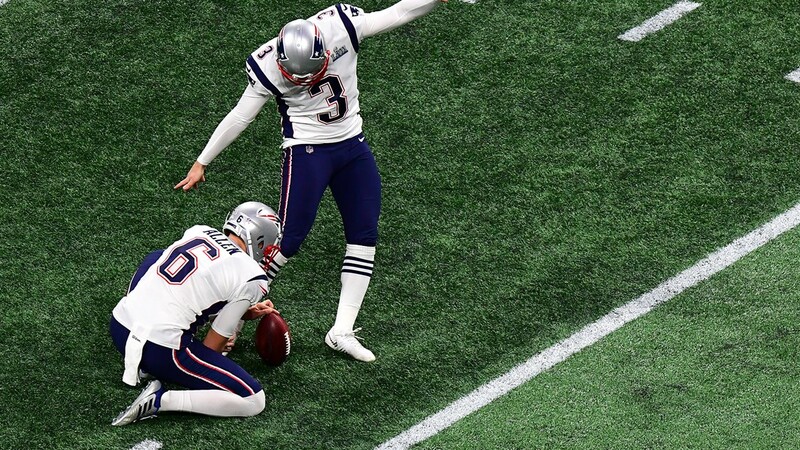 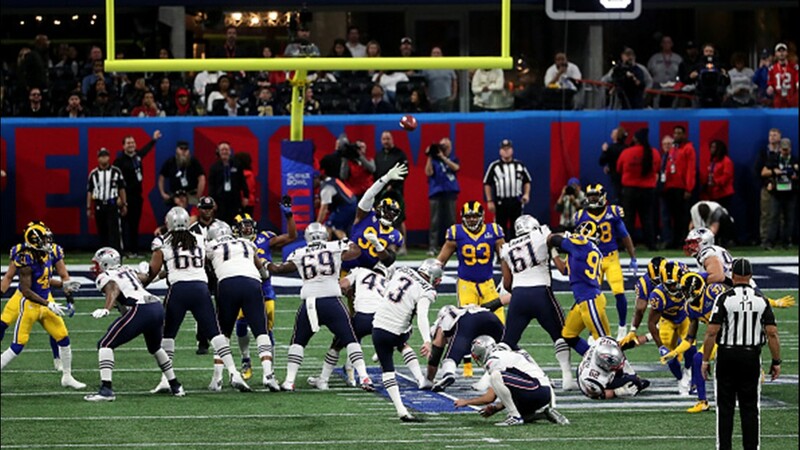 Stephen Gostkowski #3 of the New England Patriots misses a first quarter field goal attempt against the Los Angeles Rams during Super Bowl LIII at Mercedes-Benz Stadium on February 03, 2019 in Atlanta, Georgia. 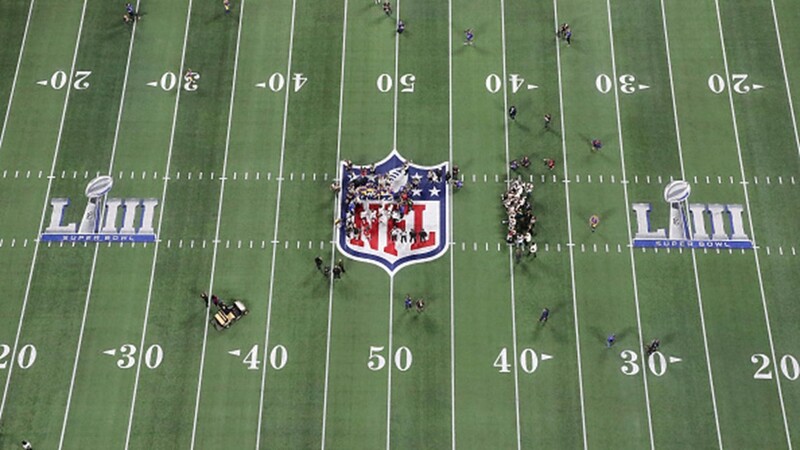 An aerial view of the field during the Super Bowl LIII at Mercedes-Benz Stadium on February 3, 2019 in Atlanta, Georgia. 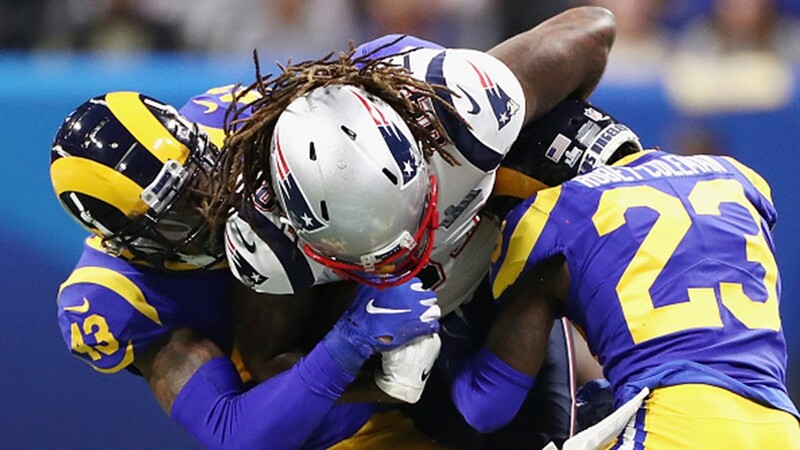 John Johnson III #43 of the Los Angeles Rams and teammate Nickell Robey-Coleman #23 tackle Cordarrelle Patterson #84 of the New England Patriots in the first half of the Super Bowl LIII at Mercedes-Benz Stadium on February 3, 2019 in Atlanta, Georgia. 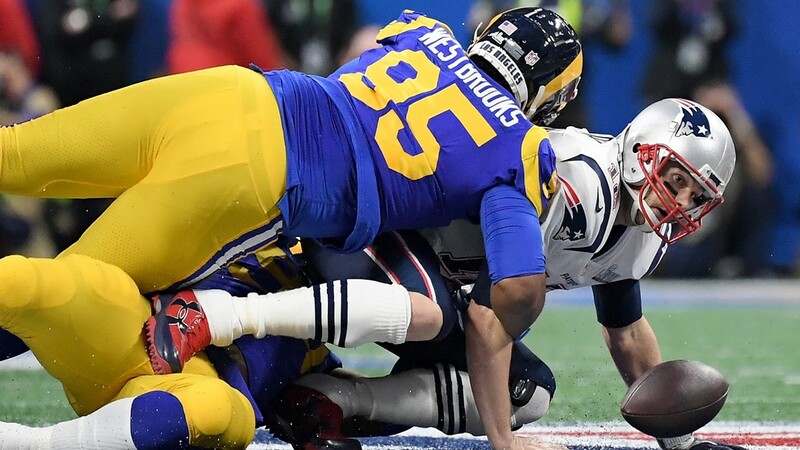 Tom Brady #12 of the New England Patriots is sacked by Aaron Donald #99 and Ethan Westbrooks #95 of the Los Angeles Rams in the first half during Super Bowl LIII at Mercedes-Benz Stadium on February 3, 2019 in Atlanta, Georgia. 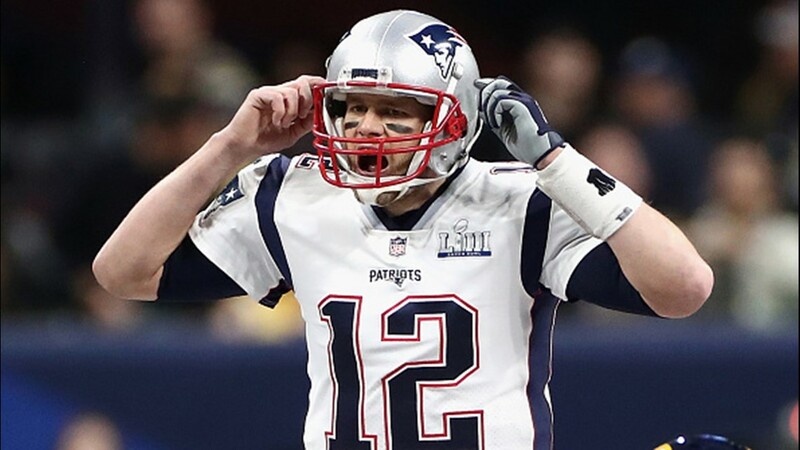 Tom Brady #12 of the New England Patriots gives instructions to his teammates in the first half of the Super Bowl LIII against the Los Angeles Rams at Mercedes-Benz Stadium on February 3, 2019 in Atlanta, Georgia. 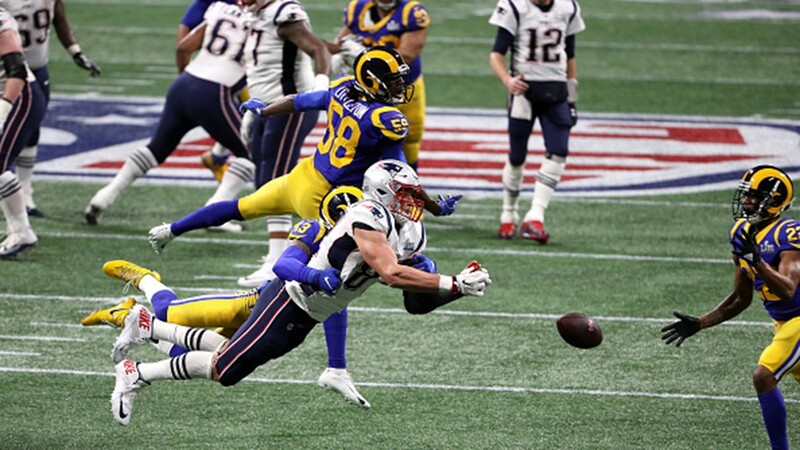 Rob Gronkowski #87 of the New England Patriots misses a pass under pressure from John Johnson #43 of the Los Angeles Rams in the second quarter during Super Bowl LIII at Mercedes-Benz Stadium on February 03, 2019 in Atlanta, Georgia. 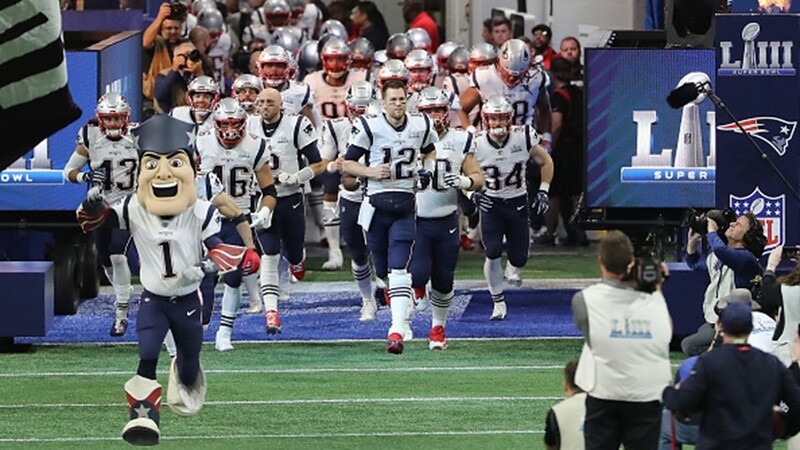 Tom Brady #12 of the New England Patriots and his teammates take the field prior the start of the Super Bowl LIII against the Los Angeles Rams at Mercedes-Benz Stadium on February 3, 2019 in Atlanta, Georgia. 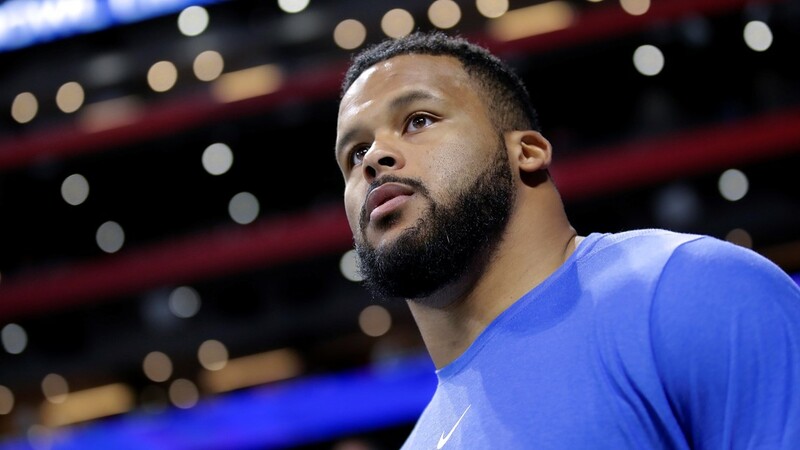 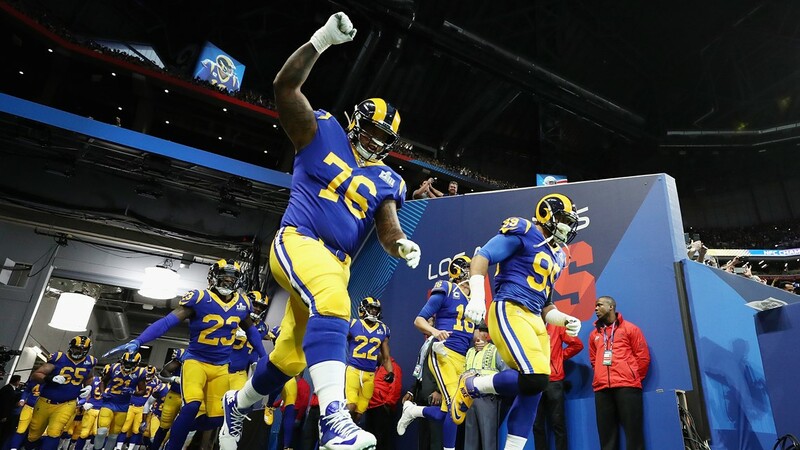 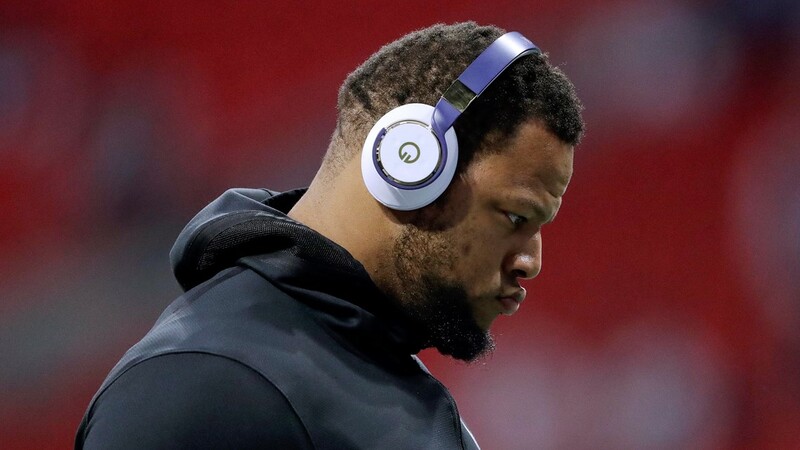 Rodger Saffold #76 of the Los Angeles Rams jumps into the field prior the star of the Super Bowl LIII against the New England Patriots at Mercedes-Benz Stadium on February 3, 2019 in Atlanta, Georgia. 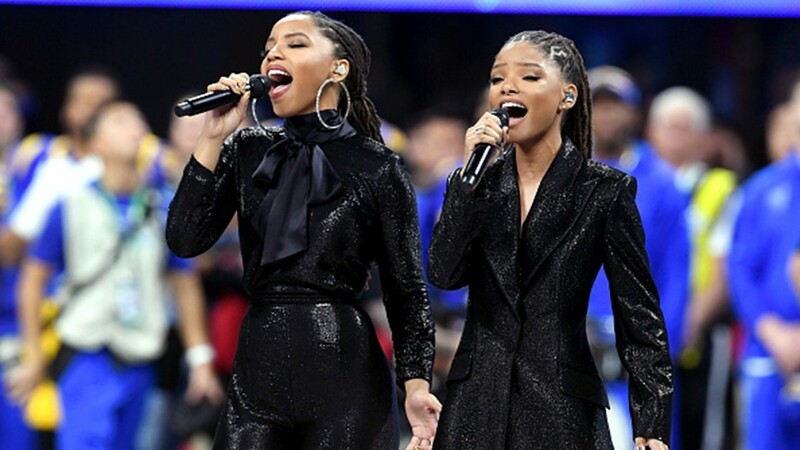 Halle Bailey (L) and Chloe Bailey of Chloe X Halle perform during the Super Bowl LIII Pregame at Mercedes-Benz Stadium on February 3, 2019 in Atlanta, Georgia. 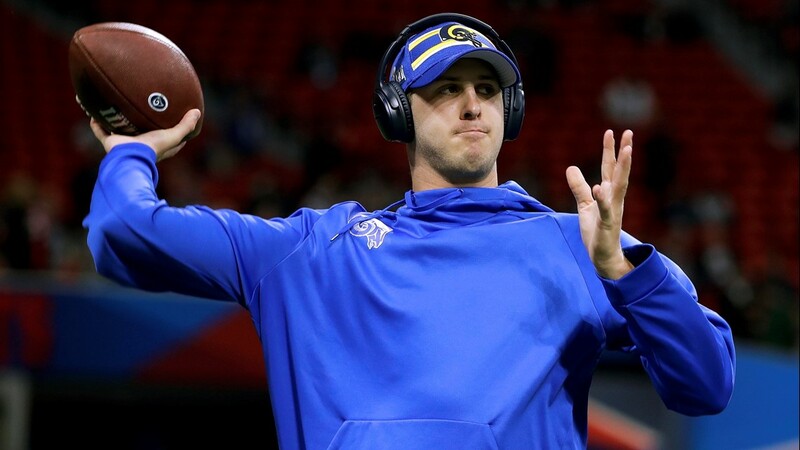 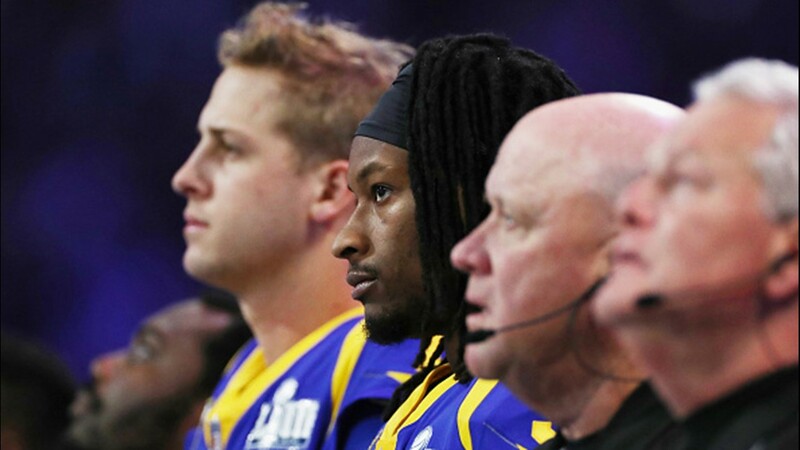 Jared Goff #16 of the Los Angeles Rams looks on during the National Anthem at Super Bowl LIII against the New England Patriots at Mercedes-Benz Stadium on February 3, 2019 in Atlanta, Georgia. 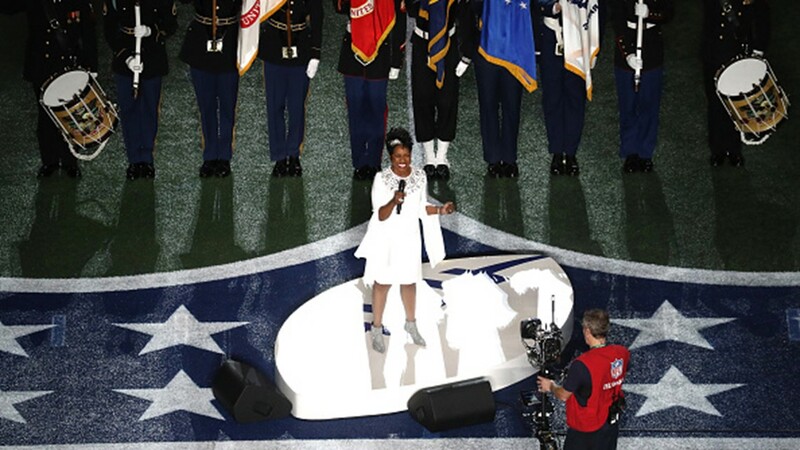 Gladys Knight performs the National Anthem prior to Super Bowl LIII between the New England Patriots and the Los Angeles Rams at Mercedes-Benz Stadium on February 03, 2019 in Atlanta, Georgia. 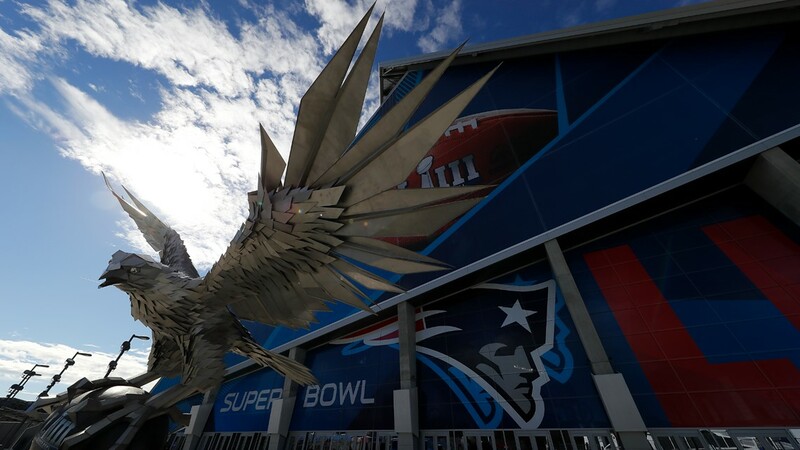 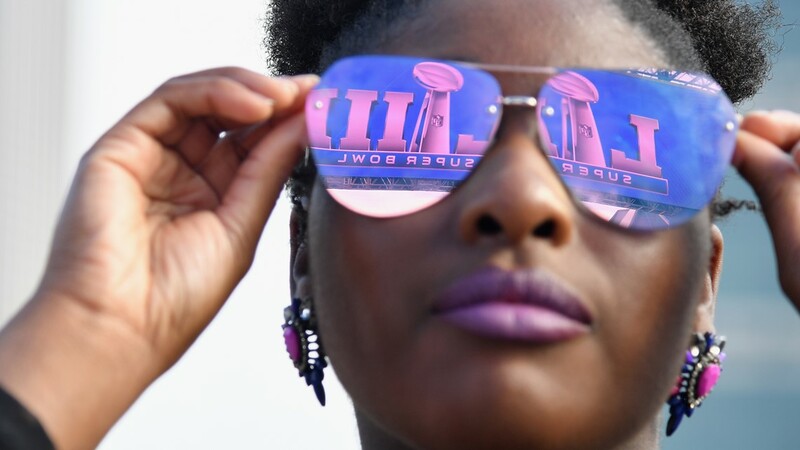 The Super Bowl logo is reflected in a woman's sunglasses outside the Super Bowl Experience in Atlanta, Georgia on February 2, 2019. 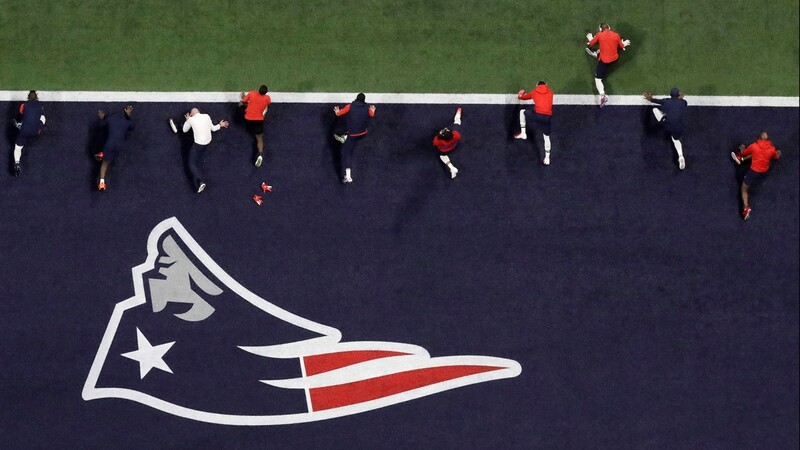 New England Patriots stretch before the NFL Super Bowl 53 football game between the Los Angeles Rams and the New England Patriots Sunday, Feb. 3, 2019, in Atlanta. 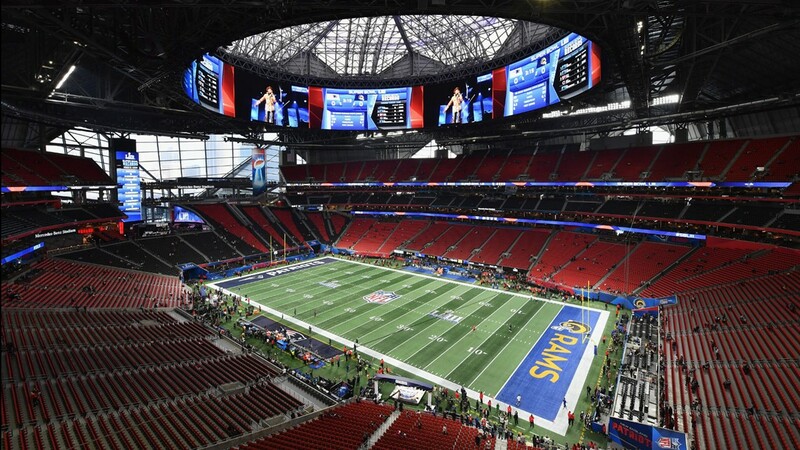 Los Angeles Rams players stretch before the NFL Super Bowl 53 football game between the Los Angeles Rams and the New England Patriots, Sunday, Feb. 3, 2019, in Atlanta. 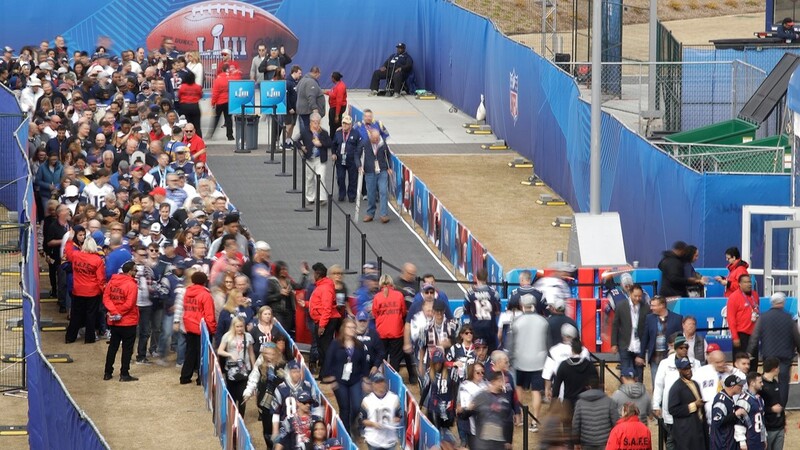 People arrive at Mercedes-Benz Stadium for Super Bowl LIII between the Los Angeles Rams and New England Patriots, February 3, 2019 in Atlanta, Georgia. 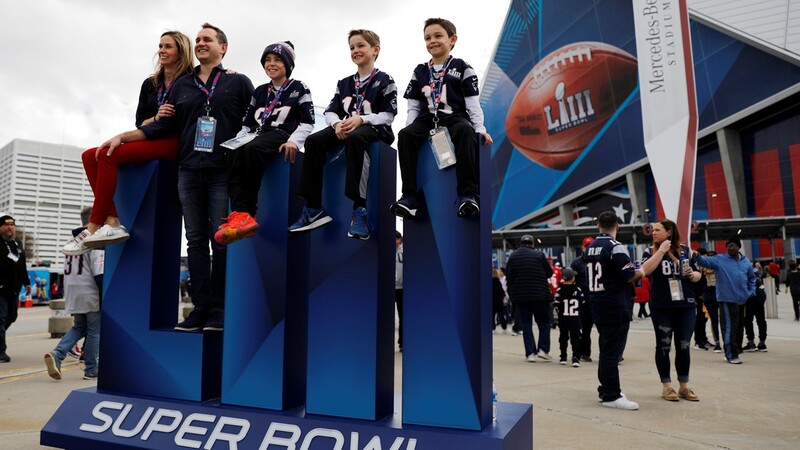 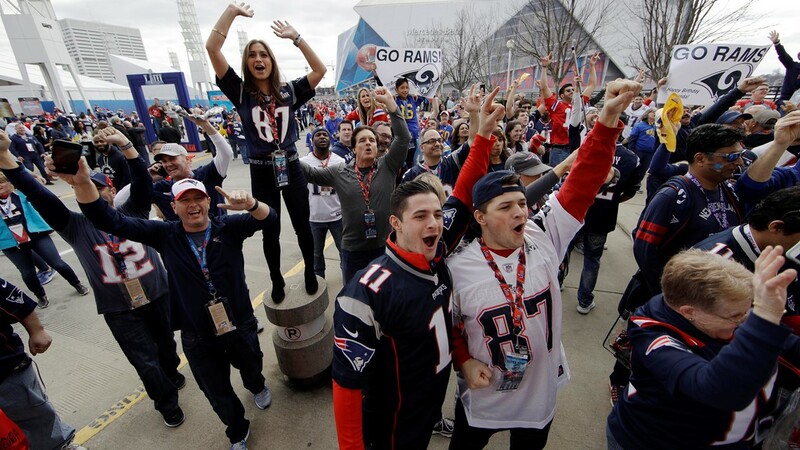 Fans cheer outside a television studio near the Mercedes-Benz Stadium, Sunday, Feb. 3, 2019, in Atlanta, ahead of the NFL Super Bowl 53 football game between the Los Angeles Rams and New England Patriots. 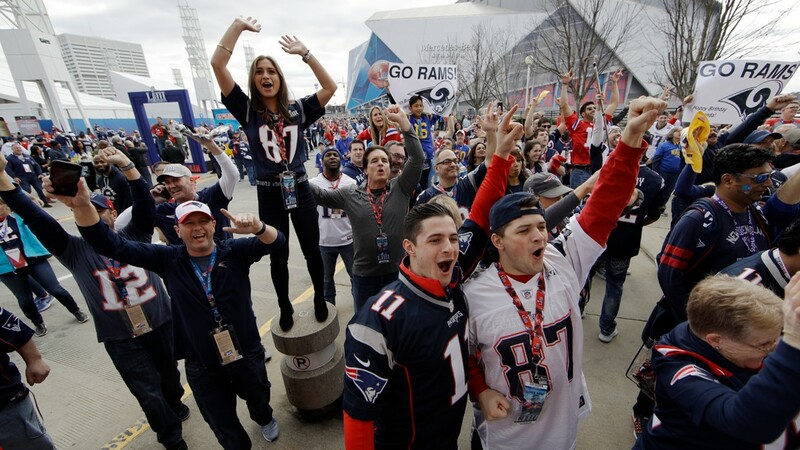 Fans dance during the Super Bowl Experience in Atlanta, Georgia on February 2, 2019. 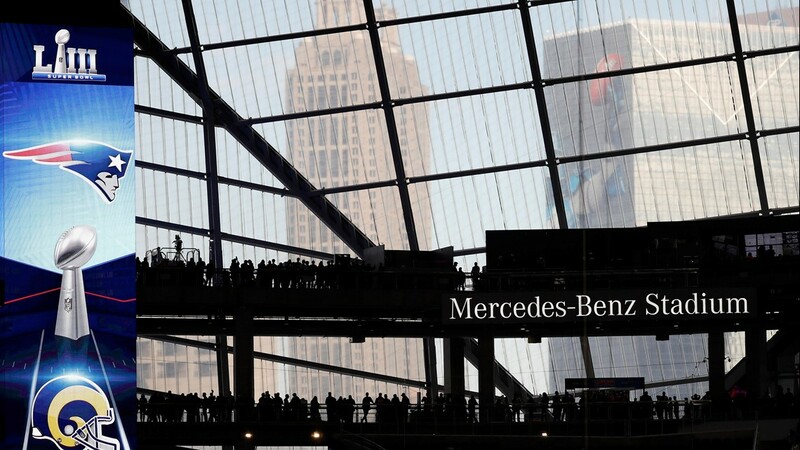 View of the Mercedes-Benz Stadium in Atlanta, Georgia on February 2, 2019. 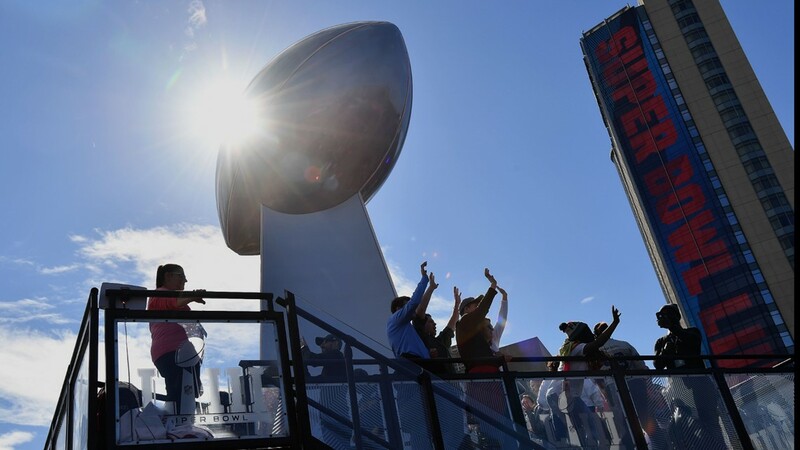 Fans gather at the Centennial Olympic Park during the Super Bowl Experience outside the World Congress Center in Atlanta, Georgia Febuary 2, 2019. 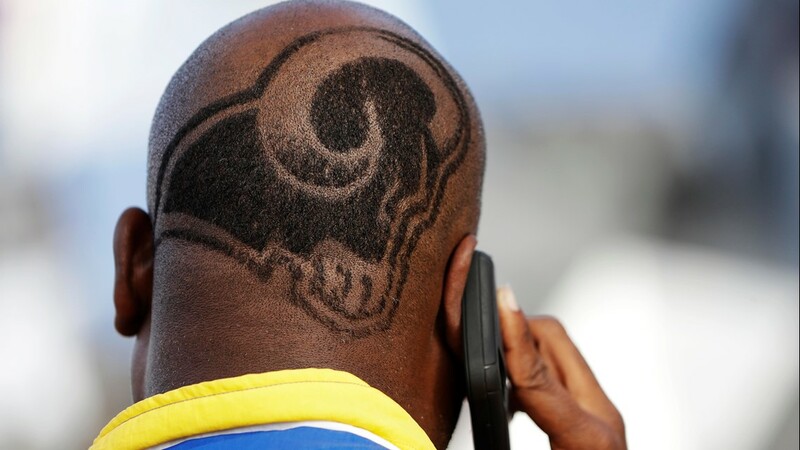 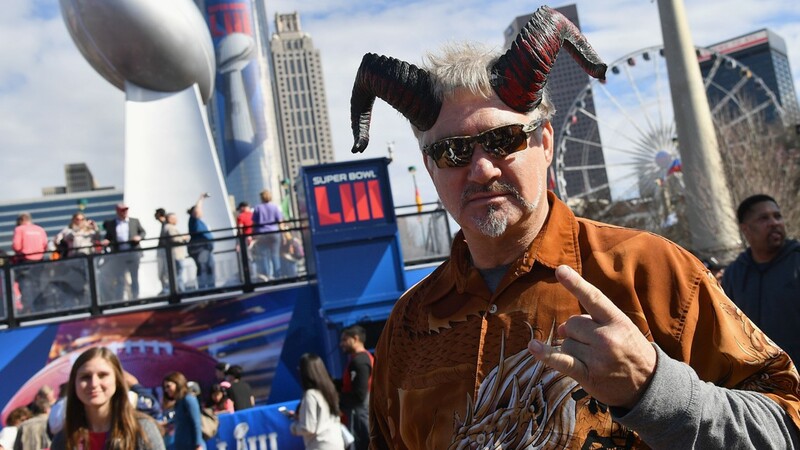 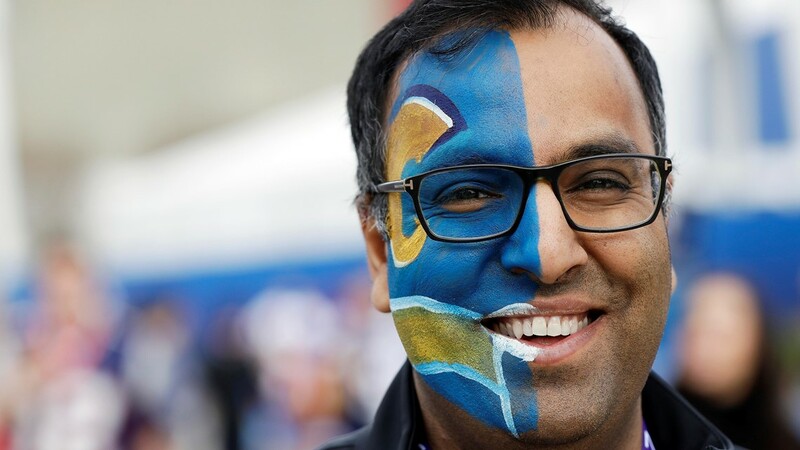 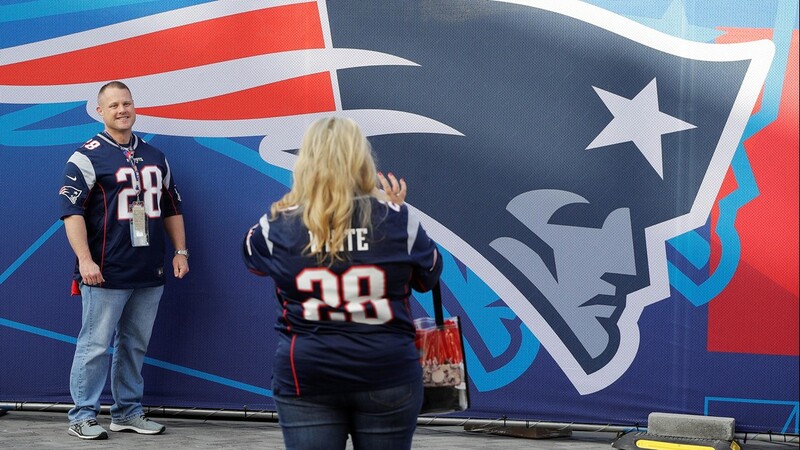 A Los Angeles Rams fan poses outside the Super Bowl Experience in Atlanta, Georgia on February 2, 2019. 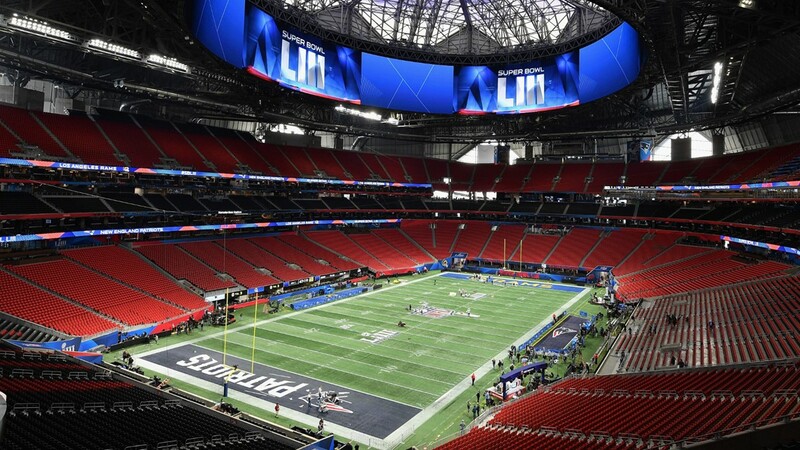 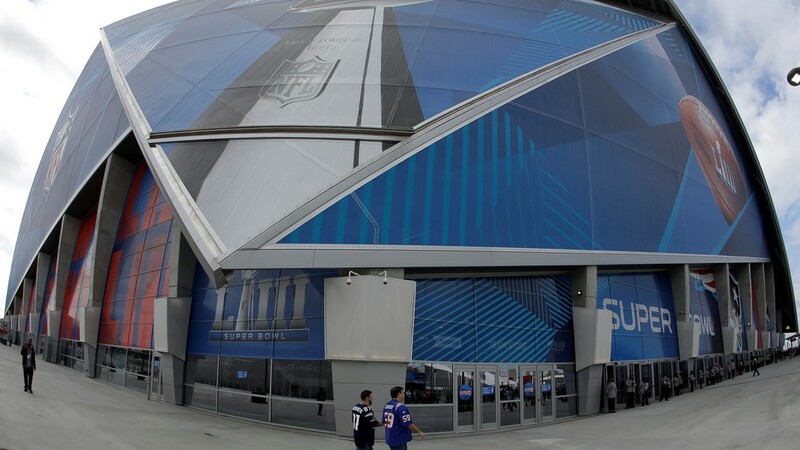 A general view of Mercedes-Benz Stadium ahead of Super Bowl LIII on February 2, 2019 in Atlanta, Georgia. 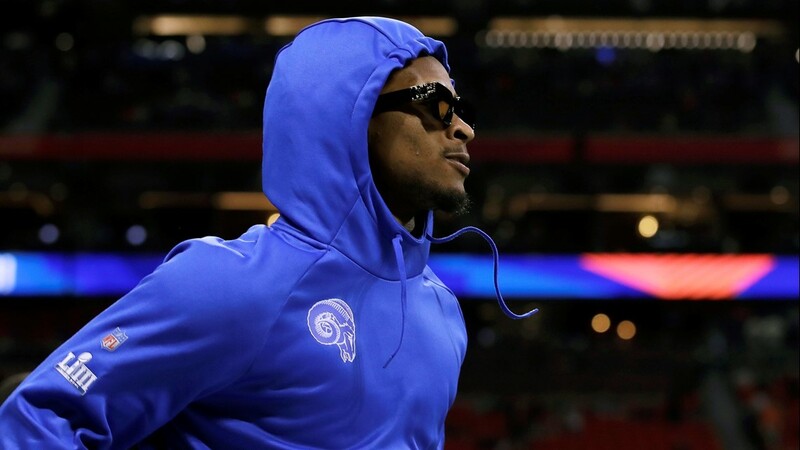 Los Angeles Rams' Todd Gurley II warms up before the NFL Super Bowl 53 football game between the Rams and the New England Patriots Sunday, Feb. 3, 2019, in Atlanta.